LONDON — Parliament approved plans to make Europe's biggest airport even bigger, backing on Monday what the government described as the most important transportation decision in a generation. The House of Commons voted overwhelmingly, 415-119, to build a third runway at Heathrow Airport after hours of debate on the 14 billion-pound ($18.6 billion) project. The decision follows decades of study and argument over how to expand airport capacity in southeastern England, and it is certain to be challenged in the courts. Prime Minister Theresa May believes the project will boost economic growth while signaling the country's commitment to expand international trade and transport links as it prepares to leave the European Union. Neighbors and environmentalists object because of concerns about pollution, noise and the communities — some dating back hundreds of years — that will be destroyed. Business groups strongly backed the government. They argued that increasing the capacity at Heathrow would be tantamount to putting out an "open for business" sign as Britain prepares to leave the European Union. "This is a really important moment in the history of this House and the history of this country," Transport Secretary Chris Grayling told the House of Commons as he appealed for lawmakers to "move on from decades of debate and set, to my mind, a clear path to our future as a global nation in the post-Brexit world." Opponents object to the third runway on environmental, noise and financial grounds. Friends of the Earth described it as a "morally reprehensible" move that would result in Heathrow emitting as much carbon as the whole of Portugal. Greenpeace said that if ministers wouldn't protect people from toxic air, opponents would ask a court to do so. John Stewart, a longtime opponent of Heathrow expansion, took to Twitter to lament that the new runway had become a government policy. "A third runway will turn peaceful areas of London & the Home Counties into torrents of noise as planes pass over at a rate of 1 every 90 seconds," he said of the towns under the airport's flight path. London Mayor Sadiq Khan has pledged to join local government councils in filing legal action seeking to block the expansion and has said Heathrow already exposes the city to more aircraft noise than Paris, Frankfurt, Amsterdam, Munich and Madrid combined. He argues that the project would also push toxic emissions above legal limits. "This will be a critical moment, and for the sake of Londoners affected by poor air quality, disruption from noise and the costs needed to improve transport connections, I will do what I can to stop these poor plans," Khan said in a statement. May directed Conservative Party lawmakers to vote for the project. Foreign Secretary Boris Johnson, who once pledged to lie down in front of bulldozers to stop the expansion, avoided a confrontation with the prime minister because he was visiting Afghanistan on Monday. His absence did not go unnoticed. Opposition leader Jeremy Corbyn said Johnson, who represents the Uxbridge and South Ruislip constituency near Heathrow, should resign. "If he is unable to be present, then we have to ask the question what on Earth is he doing and who is he representing?" Corbyn said. Shouts of "Where's Boris?" 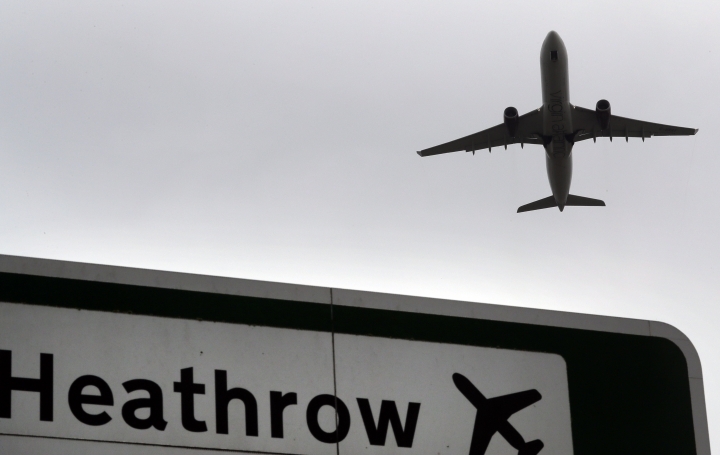 could be heard in the Commons as lawmakers spoke out against Heathrow expansion plans. Johnson, in a letter to councilors in his parliamentary district obtained by the Evening Standard newspaper, said that staying in the Cabinet would allow him to keep fighting against the runway. "Some of my critics have suggested that I should resign over the issue. No doubt they have my best interests at heart," the newspaper quoted him as saying. "But it is clear from what is likely to be a large majority of (lawmakers) who are in favor of a third runway that my resignation would have achieved absolutely nothing." Business groups were elated at a decision that took decades of debate. "The race for global competitiveness is well underway and the UK must now be quick off the mark - work on the new runway should start as soon as possible." Said Carolyn Fairbairn, the director general of trade group, the CBI. "The prize is tens of thousands of jobs and billions of pounds of growth for the British economy. Some airline CEOs quickly applauded the decision. Craig Kreeger, CEO of Virgin Atlantic, said the vote sent "a strong signal to the world that we're open for business." But the view was not universal. Willie Walsh, the CEO of IAG, the parent company of British Airways, said Parliament had little idea of the costs involved. "We have zero confidence in Heathrow's management's ability to deliver this project while keeping airport charges flat," he said, adding that IAG was looking to the regulator, the CAA, "to fulfil its role to protect consumers and stop Heathrow rewarding its shareholders to the detriment of the UK." In a reflection of the divisiveness of the vote, former Conservative Party Transport Secretary Justine Greening — who broke with her party to reject expansion — told lawmakers the story of Heathrow was one of "broken promises, broken politics and broken economics". "People simply get ignored in this process, you actually have to be either a big business or, I think, a big union before your voice counts, and that is totally unacceptable," she said.